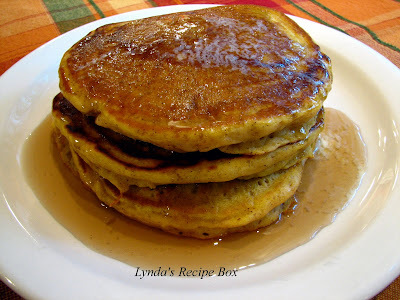 Lynda's Recipe Box: Pumpkin Pancakes- A Delicious Way to Start the Day! Pumpkin Pancakes- A Delicious Way to Start the Day! My family loves having breakfast foods for dinner during the cooler months of the year, so earlier this week I decided to try making Pumpkin Pancakes. I had just enough pumpkin left over from making the Pumpkin Bread Pudding a few days earlier. I must say that these wonderful pancakes are delicious! They are not too sweet or too spicy, but flavored just right for a perfect Autumn breakfast, (or dinner!). Son Number 2 LOVED them, so I've made them twice already. This is the son that is reluctant to try new foods, so these pancakes surprisingly won him over! Actually, my whole family loved them, so this recipe is a deffinate keeper, as I'm sure I'll be making them often. The only trouble I had with these pancakes was trying to take a good picture before the butter melted! Here's the recipe. Fold these ingredients into the flour mixture. pancake. Cook about 3 minutes per side and serve hot with butter and syrup. Yields about 8-10 pancakes. These are awsome Pumkin Pancakes! I hope you try them; your family will love you even more. Have a great weekend, my friends! Actually I just made some pancakes for the dinner! The pancakes made with pumpkin sound really wonderful. A winner... I love all the punkin stuff people are putting up this week... Must be that time of year! These look wonderful. I suspect they taste as good as they look. Have a wonderful Halloween weekend. I love pumpkin pancakes. I make a cheater version that is great so I can only imagine how good the "from Scratch" batch would taste! What a great recipe. I have seen all the pumpkin recipes, the muffins, breads, risottos, soups, nothing struck my fancy. I want to try this. My daughter has a problem eating breakfast for anything but breakfast. I can't even get her to eat it for lunch! or brunch! Hi Lynda! I am a pumkin fan, however not a pancake fan. But this has inspired me to try out a new recipe using canned pumpkin. I saw a gorgeous recipe somewhere for a Pumpkin Angel Food Cake with Browned Maple Glaze that I will have to try, and try to find (thinking outside of the box).P.S.-No pumpkin risotto or pasta either, I like mine sweet not savory! Flavorful and beautiful! These pancakes look so tasty. Excellent pix. i prefer my pancakes fully saturated with butter and syrup, and i completely condone your serving suggestion here. lovely stack, lynda! We enjoy breakfast for dinner often in our house. This is perfect for Halloween. The kids bellies would be full after a few of these pumpkin pancakes, just in time to o trick or treating. What a great idea! I have trouble trying to get the photo before the butter melts too - I keep an extra pat on hand just for that! I have extra pumpkin puree left too, I should try this soon. Well now, those look down right delicious and we used to have pancakes for supper all the time...so I could use some right now! Great shot actually! Those look soo yummy, I love this time of year! These pancakes look so tempting and addition of pumpkin is interesting too. 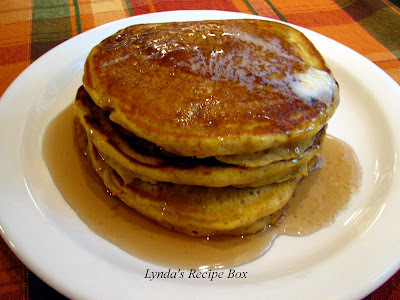 Lynda, those pumpkin pancakes look great. I love pumpkin pancakes and need to make them again soon!